Make the most of your family hiking adventure, without the hassle of packing up the car and driving to the trailhead each day. On this trip, experienced alpine guides whisk you away from a mountaintop lodge each morning by helicopter, to some of the world’s best hiking trails. Every hike will be catered to your abilities, making this a perfect adventure for all ages. 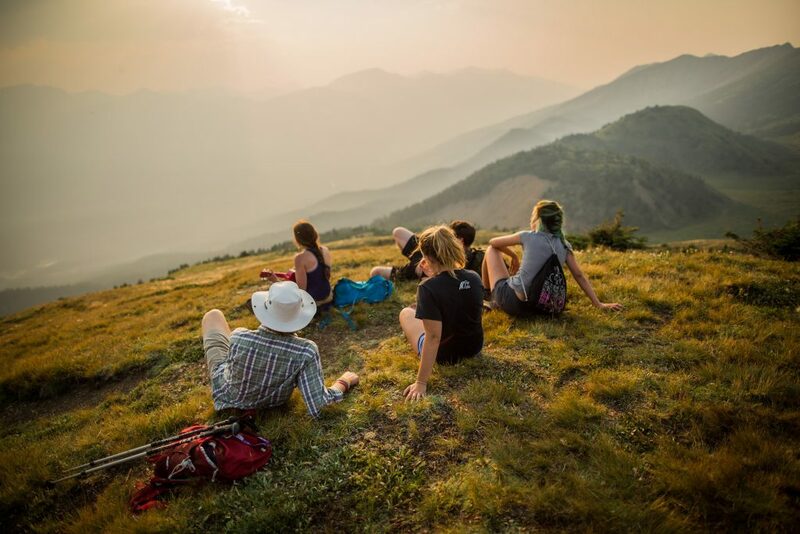 Leave the crowded trails of Banff behind, and experience hiking high above the tree line. Best of all, each hike is accessible by helicopter – a thrilling way to start your day. You’ll be immersed in pristine wilderness – something few people ever get to experience. Discover alpine lakes, wildflowers, and endless views as far as the eye can see. Your cozy mountaintop lodge, accessible only by air, is the perfect place to unwind and spend time together each evening. Enjoy delicious food, a soak in the hot tub, and great company as the sun sets behind the mountain peaks. Welcome to Calgary International Airport! Collect your rental car to begin your exploration of the Canadian Rockies. Banff is a unique destination – a UNESCO World Heritage Site with all the charm of a small mountain community. Breathe in the fresh Canadian Rockies air – you’ve arrived! Consider staying in the quieter town of Canmore, just 30-minutes from Banff. Overnight at The Moose Hotel & Suites. This hotel is conveniently located just steps from downtown Banff. Amenities include a spa, indoor pool, sauna, fitness room, restaurant, and complimentary wi-fi. Enjoy the two rooftop hot pools - perfect for taking in the view of the Rocky Mountains after a day of exploring! Head out for a day of exploration in the Canadian Rockies. Today your activity options offer something for the whole family. Challenge yourselves by learning new skills or simply enjoy the beautiful setting of Banff National Park. This exciting whitewater paddle on the Kananaskis River is a wonderful introduction to rafting! The Canadian Rockies provide a dramatic backdrop as a professional guide navigates and provides insights into the natural history. Maybe even swim in the river – you will get wet! Whitewater thrills await on the Bow River! The Horseshoe Canyon offers spectacular scenery and big waves. All safety equipment and training are provided, and there will be practice time on calm waters before the big stuff. Feeling adventurous? Try an optional cliff jump into the river! Hopping into a Big Canoe is a great way to explore the Bow River together with other travelers! You'll have a qualified and entertaining guide with you as you paddle and learn about Banff National Park on the river with stories from the past and present. Enjoy the fresh mountain air and real cowboy hospitality, with a morning horseback ride along the base of Sulphur Mountain to a freshly prepared BBQ served up at the 3 Mile Cabin by the Sundance Canyon Trail. Exhilarate your senses and experience views of Banff rarely seen on this introductory tour into the exciting world of Via Ferrata! Enjoy a full day at your leisure. Use your rental car to explore the Canadian Rockies, maybe visit the Icefields Parkway. Or simply relax and save your energy for your heli-hiking adventure tomorrow. The excitement begins bright and early with a hosted motorcoach transfer to the heli-pad, before flying into the wilderness. Fly to a remote lodge, accessible only by helicopter. Welcome to the world’s biggest playground! Families bond over exciting zip-lines, rock climbing, wild animals and jaw-dropping mountain views. Continue exploring amazing mountain terrain and discover areas few people ever get to visit. Hiking takes place between 1,828m (6,000ft) and 2,438m (8,000ft) – a comfortable altitude for most people. Heli-hikes can accommodate all abilities, regardless of age. Activities like snow sliding, and pond swimming are fun for all ages. Another day of adventure awaits. Your comfortable mountain lodge provides an ideal location to explore the region on this special family departure. Explore the terrain of the Columbia Mountains. Enjoy different hiking locations in the morning and afternoon. Mountain vistas, alpine lakes, wildflowers, and glaciers will leave you in awe. Enjoy gourmet meals and mingle with fellow guests, while the kids enjoy fun evening activities. Your trip of a lifetime comes to an end today. Sit back and think of all that you've accomplished as you travel on wards. Say goodbye to the Rockies as you return by helicopter to the landing pad, where a bus transfer meets you to take you to the Calgary Airport. Much too soon you leave the beautiful colours and crisp air of Canada behind as your family vacation comes to an end.